In this video we will discuss, why and how a deadlock can occur in multithreading with an example. Thread 1 has already acquired a lock on Resource 1 and wants to acquire a lock on Resource 2. At the same time Thread 2 has already acquired a lock on Resource 2 and wants to acquire a lock on Resource 1. 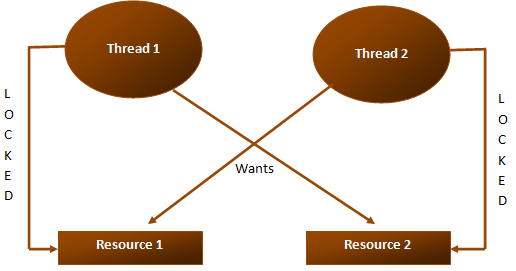 Two threads never give up their locks, hence a deadlock. + " trying to acquire lock on "
+ " acquired lock on "
" back in action and trying to acquire lock on "
hi kudvenkat sir.. why we cant have only one lock in transfer.